Celebrate Day of the Dead with L.A.’s Buyepongo at the Echoplex on Sunday, November 4. Buyepongo are keeping Latino roots music alive with a sonic fusion of sounds, from cumbia to merengue, and everything in between. They will be rocking the Echoplex with a little help from their friends – Chicano Batman, Olmeca, La Chamba, Jungle Fire, Quita Penas, DJ Anthony Valadez (KCRW), DJ Sloepoke and Ervin Arana are all supporting. There will also be altar displays, artisan vendors, and free giveaways! Tickets to the show are $12-15, doors at 5:00 p.m., music starts at 6:00 p.m. and this show is 18+. Enter the contest below for a chance to win a pair of tickets, courtesy of our friends at the Echoplex. You must have a Twitter or Facebook to enter the contest. First make sure you’re following Grimy Goods on Twitter here and/or “like” our Facebook page here. We’ll pick winners on Thursday, November 1. The winners will be direct messaged on Twitter or contacted below their contest entry comment on the Grimy Goods Facebook page. Winners will have until 10 a.m. on Friday, November 2 to claim their win or the tickets will be forfeited. To increase your chances, enter the contest both ways! Via Facebook: Just leave a comment on the Grimy Goods Facebook page telling us what you should win! 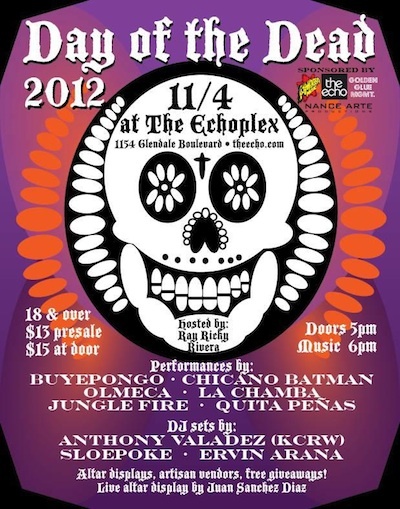 Be sure to mention Day of the Dead with Buyepongo at the Echoplex so we know which contest you’re entering! 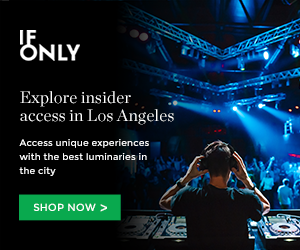 This entry was posted in Giveaways and tagged Buyepongo, Chicano Batman, contest, Day of the Dead, DJ Anthony Valadez, DJ Sloepoke, Echoplex, Ervin Arana, giveaway, Jungle Fire, La Chamba, Olmeca, Quite Penas, sweepstakes, ticket giveaway, tickets contests, win on October 31, 2012 by Emily Saex.